When you have taken portraits for a family since their first child was about to be born... well, our annual gathering for their session is sure to bring out all of the goofy. We also seem to have a slight affinity with rain these past couple years, so that certainly didn't keep us from meeting at Shaw Park in Gorham, Maine, when the forecast was less than ideal. My relationship with Michelle & Jory goes back almost three years at this point since they first contacted me to photograph their wedding at the Maple Hill Farm Inn in Hallowell. Since their first message, I've been lucky to photograph their engagement portraits, wedding, maternity portraits and, now, their family. Seeing them each time is like spending time with old friends at this point. My relationship with April & Dan has been growing for some time since they first came to me for their snowy engagement pictures. I remember that day as if it was yesterday: snow up past my knees, their outfits themed to go along with their wedding colors, and more laughter than I could sufficiently describe in words. Since then, I'd been blessed to capture their wedding, maternity portraits announcing their first pregnancy, and then their first son's portraits. When they decided to expand their family again, I swear I was one of the first ones to know. It was with that deep bond that I have been anxiously checking my phone for the past few weeks waiting to hear of Rowan's arrival. That message came shortly after he came into this world and I have been giddy with excitement for the past week waiting to meet him (and to see his brother again). This morning I arrived at their home to welcome their newest arrival. James has become such a handsome little man since I first photographed him almost a year ago. And there, in a bundle, was his new little brother, Rowan. He was fast asleep without a care in the world. Seeing April & Dan in their early days as parents of two young boys brought a smile to my face. The entire time I was there, it was so very clear to me just how perfectly suited their are for each other and for this crazy life as parents to two young ones. They tackled every moment as a team. From using the dog dish as a splash table to hiccup induced messes to climbing on top of the toys... they were the most calm, cool, and collected parents I think I have ever seen. Being parents... this is what they were meant to be. And they were meant to do it together. April & Dan, thank you so much for letting me into your life to capture so much of your story together. It makes me happier than I could ever tell you to see how you both have evolved over the years. James & Rowan are very lucky to have you both. Here is a sneak peek at what I have in store for them in the days to come. This session. Oh, my heart! My relationship with Trish & Rob goes back several years at this point when I first photographed them for their engagement session. Then their wedding at the Spurwink Church and Mariner's Banquet Center in Portland. And then they had Carly and called for me to visit them for her newborn portraits. And then a year flew by and it was time for her first birthday session. I know it's cliché, but really... where did the year go? Seeing the family again for another session means more to me than I could ever put into words. Watching Carly walk around, smile, look deeply at the clouds and trees around her, her whispy hair being blown around.... she is becoming such an incredible little human! I also see nuances of her dad and his family in some of her spunky moments. Her mom is in there too with her sparkly eyes and big smile. And this post would not be complete without mentioning my love for the big ol' cocoa puff with legs... Rocky. As soon as I saw him, he got so excited and started dragging Rob along to see me. Much like Rob & Trish, Rocky and I have been buds since their engagement session and seeing him again for each session makes me smile a bit more. And it makes him jump a bit more, too. I am such a sucker for dogs! Carly, Trish, Rob... and Rocky... thank you so much for having me capture this milestone for your family! Carly is so amazing and very lucky to be a part of such and incredible family. Love you guys! With the Christmas cards officially sent out (and I got one, YAY! 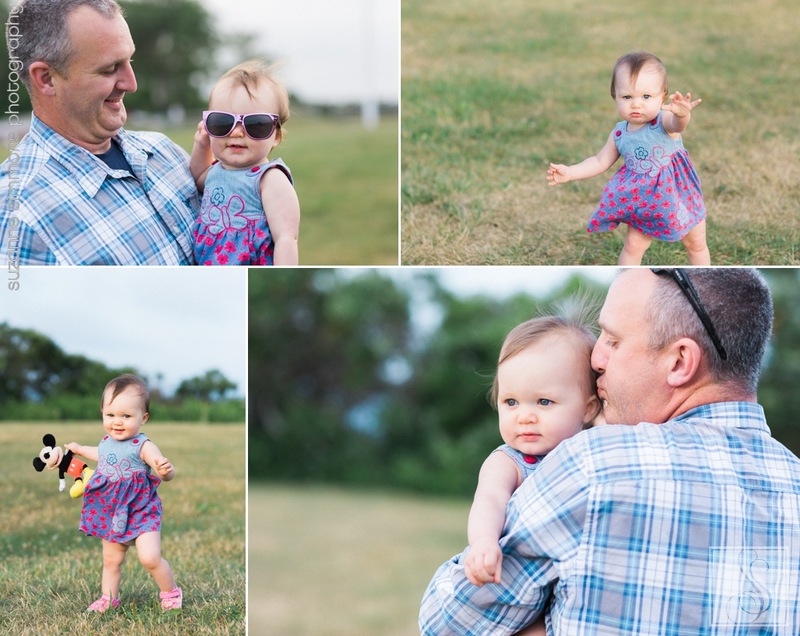 ), I can now safely share a couple shots from my mini session with the "G" family this fall on Mackworth Island. I have been very fortunate to have known Heather and Mike since before there were munchkins running around and watching them grow in to a family of three and then in to a family of four has really been a blessing. You may remember their daughter from her newborn session, complete with an LLBean boat tote, almost exactly a year ago. I dare say, at this point, that hanging out with me and my daughter could very well result in photos being taken! That's so awesome! Choosing even a couple photos to share from our mini session is absurdly hard with a family as cute as this one. But here is a small selection of what we captured together this time. Does it get any cuter? I think not! Fall is always a time of recovery for me. Catching up from the craziness of the summer and editing a ton of sessions and wedding; spending time with my family before my baby girl grows up; and writing a bazillion blog posts that I've had on the back burner. This portrait session from the summer makes me heart so full it could burst. I first met Tarryn & Sean years ago back in 2010 when they tied the knot at the Pemaquid Light House. To this day, their wedding resulted in my of my all time favorite photos. After all these years, I will thought of them often and wondered how they were doing. So, when Tarryn contacted me to set up a family portrait session while they were on vacation in Maine, I just about jumped for joy! I absolutely love hearing from my past couples and hearing how married life has been treating them. Getting to meet their offspring? Sign me up! We got together on Macworth Island off the coast of Falmouth, Maine, and took their son and two furry kids for a walk (or should I say that they took Aaron for a walk). Along the way we captured moments that make life perfectly imperfect: plopping down in the middle of the path and getting dirty, eating sand on the beach, the dogs wanting to be anywhere except for where we wanted them... the list goes on. My favorite shots were taken on the beach when the dogs were worn out and sleeping in the air conditioned car. The smiles. The laughs. That's real life. Geez, I love this family! Here are some sneak peek shots from our time together at the lake. It was such a gorgeous day and feels so long ago now. Snow will be flying before we know it at this rate and the lake will start to freeze. At least we'll have these photos to look at to warm us up! I've been a ton behind on my blog posts this fall. I have all of the photos ready to go. I just needed to have a moment to sit down and reflect. It's never something I like to rush, you know? So I'm hoping to start getting these shots out there to be enjoyed by the masses and not just my "Draft" box for my blog. I met up with the "M" family for a super impromptu session of their girls while I was on vacation with my own family in Bar Harbor. Truth be told, my husband is, in a round about way, related to this awesome foursome and we've seen each other a fair amount over the years. They wound up staying in the same campground as us and even a few sites down. When the girls' mom proclaimed that she had to get pictures done of the girls by me, I piped right up and said "What are you doing tonight?" I had my gear for a wedding I was shooting that weekend, so it was an easy option. So down to the beach we went! I had an awesome time with these two incredible ladies as we explored the coastline while the tide was out. Getting them in to one frame together took a miracle, but it all paid off with some really fun photos of the two of them together. I cannot get over how fast they are growing up! I think the highlight of the session was towards the end when the ladies invited themselves to dig clams with one of the nicest clammers I've ever met. They jumped right in what he was doing and he took the time to explain it all to them and they even tried to help. You, sir, are awesome! Here are some sneak peek shots from our session. I saved my favorites for the illustrious holiday cards, but these ones are still pretty awesome in my book.